As an organisation or business who has staff, customers, visitors and/or suppliers, you have a 'Duty of Care' to provide all female staff and visitors with a suitable and safe way to dispose of sanitary waste. We at Janitorial Direct Ltd can help you provide this. Our user friendly sanitary bins come in a variety of finishes and a choice of sizes to suit your washroom facility. Our hands free units have been designed to provide the user with a quick and easy way to dispose of their waste. All our units are pedal operated, and are slim line to fit perfectly in your cubical next to the WC. We can also offer automatic units which will open without any need touch to help provide a cleaner, more hygienic washroom. Be compliant with your 'Duty of Care'. Slim line to fit your cubical. What is the Liner System? We provide our customers with the liner system when they take out a sanitary waste disposal service with us. This means we can give you the minimum amount of disruption to your business or organisation. 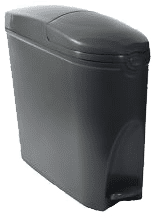 The liner system is a discreet service which is under taken within the toilet cubical, with the use of a liner within the sanitary bin which collects all of the waste. This also means that you will always have the same bin giving you peace of mind knowing that it has only ever been with you. All of the sanitary bins have a bactericidal chemical deposited into them, which very effectively reduces any odours. The unit is always cleaned and sanitised thoroughly, and the waste is removed discreetly and disposed of in the correct manner via our fully compliant waste transfer vehicles. Our granular bactericide reduces unpleasant odours. Waste is removed of discreetly. Our well trained staff will come and install the sanitary bins where ever they are needed. Your units can then be serviced as often as you require from weekly, two weekly and four weekly according to your usage. We clean and deodorise your units with each service and dispose of the waste discreetly without removing the bin, this avoids dragging your bin and its waste through your property for people to see or smell. We allocate every site to one service operative, this means that you will (aside form annual leave and illness) always get the same operative servicing your units. We find that this make the experience better for our customers, and our operatives won’t have to ask you where your units are when they come to service. We at janitorial Direct pride ourselves on our service and are always striving to improve. All of our operatives and well trained and CRB checked. We have a brilliant track record with all our customers and very rarely have any issues, however when we do we guarantee that it will be resolved as soon as possible.